Survivor: Blood vs. Water (2013) - 7th place, 14th out - 5th juror. Voted out in Episode 13, "Out on a Limb" (Day 35). Eliminated in a duel (by Tina Wesson) in Episode 14, "It's My Night" (Day 36). 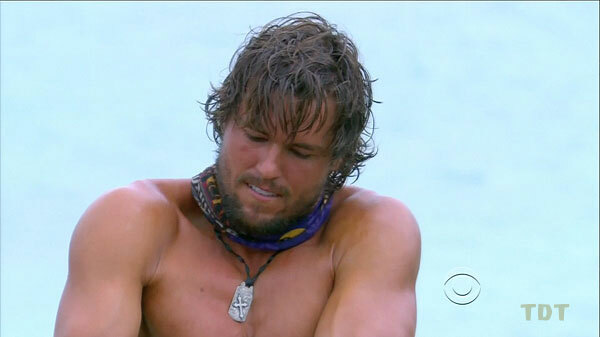 Cumulutative longevity totals: In-game - 35.5 days; Redemption Island - 1 day. Blood vs. Water Ep. 1 RC/IC: "Blue Lagoon Bustle" - Swims and rows for Tadhana; Tadhana loses. Blood vs. Water Ep. 2 RC/IC: "In The Barrel" - Tosses skee-balls for Tadhana; Tadhana loses again. Blood vs. Water Ep. 3 RC/IC: "Sumo at Sea" - Wins his bout against Tyson, but Tadhana loses once again. Blood vs. Water Ep. 5 RC/IC: "Slide Show" - Loses to Tyson, but beats Gervase, and Tadhana wins 5-2. Blood vs. Water Ep. 6 RC/IC: "Buoy Oh Buoy" - Now with New Tadhana, swims. Tadhana wins! Blood vs. Water Ep. 7 RC/IC: "Chain Reaction" - Retrieves bags for Tadhana, and Tadhana wins again, 3-2. Blood vs. Water Ep. 8 IC: "Flash Back" - Sixth person eliminated, on fifth item (6th/11). Blood vs. Water Ep. 9 Final 10 IC: "Pesky Palate" - Eliminated in 2nd round, sheep intestines (tie-4th/10). Blood vs. Water Ep. 9 Final 9 IC: "Balancing Point" - Eliminated right after Tyson (2nd/9). Blood vs. Water Ep. 10 RC/IC: "Splash Back" - First person to drop out (8th/8). Blood vs. Water Ep. 11 IC: "Wrist Assured" - Eventually drops out before Monica (2nd/7). Blood vs. Water Ep. 13 RC/IC: "Pulled Up" - Near the lead in the water, but does not win (bottom 4/5). Blood vs. Water Ep. 14 duel: "A Leg Up" - First person to drop out, circa 15 minutes. Eliminated (3rd/3). Blood vs. Water, Ep. 1 (Morning 1): Laura Boneham (voted out, 7-2-1). Blood vs. Water, Ep. 2: Rachel Foulger (voted out, 5-2-1). Blood vs. Water, Ep. 8: Aras Baskauskas (voted out, 7-2-2). Blood vs. Water, Ep. 9 (F10 vote): Vytas Baskauskas (voted out, 8-1-1). Blood vs. Water, Ep. 9 (F9 vote): Tina Wesson (voted out, 7-1-1). Blood vs. Water, Ep. 12: Three votes, from Tyson, Gervase, and Monica. Blood vs. Water, Ep. 13: Three votes, from Tyson, Gervase, and Monica (voted out, 3-2). Morning 1, pre-tribal split. Listening to Probst. Caleb's not voting for Ciera? What? Thanks for being so generous, Tyson! Well, at least it's not slop? I really could've used that necklace. Or the food. You people are all playing for second place. Tyson's gonna win. Tyson is conTROLLing these people! Gordon Holmes at XfinityTV.com (9/5/13): "Kat & Hayden: 'You Don't Mess with My Men or My Money'"
Rob Cesternino at RHAP (12/16/13): "Post-finale Interviews with the Survivor: Blood vs Water Final 7"
Dalton Ross at EW.com (12/16/13): "Hayden on his 'top heavy' girlfriend and the one move he wishes he made"
"'There's a target on my back from the get-go,' says Kat's loved one. That's because boyfriend Hayden has already emerged victorious on a CBS reality competition show — only that show was Big Brother. It will be interesting to see how his game translates from inside the house to outside in Mother Nature. Also interesting to see is whether the Survivor: One World lover of margaritas has matured this time around. 'I think the one thing I've learned a lot after that season is to listen,' says Kat. 'Listen more than I speak. I didn't know anything about Survivor when I played the first time, and I got to the final seven. And I don't know if anyone noticed, but that's pretty good. So the fact that I didn't know anything about the game and got pretty far might come to my advantage this time because now I know how to play.'" Personal Claim to Fame: Winning Big Brother 12. Inspiration in Life: My Grandpa - he is the best person I know and someday I hope to be as cool as him. Hobbies: Snowboarding, working out and traveling. 3 Words to Describe You: Athletic, popular and respectful. If You Could Have 3 Things on The Island What Would They Be and Why? I would bring my Ipod because music makes everything better and a surfboard. I really need to learn how to surf. Why You Think You’ll “Survive” Survivor: I have already played and won a game very similar to Survivor. What Does It Mean to You to Play Survivor with Your Loved One? Survivor is the adventure of a lifetime, and being able to share that adventure with someone I love is amazing! I can't wait to compete with or against Kat, and watch our relationship grow!"